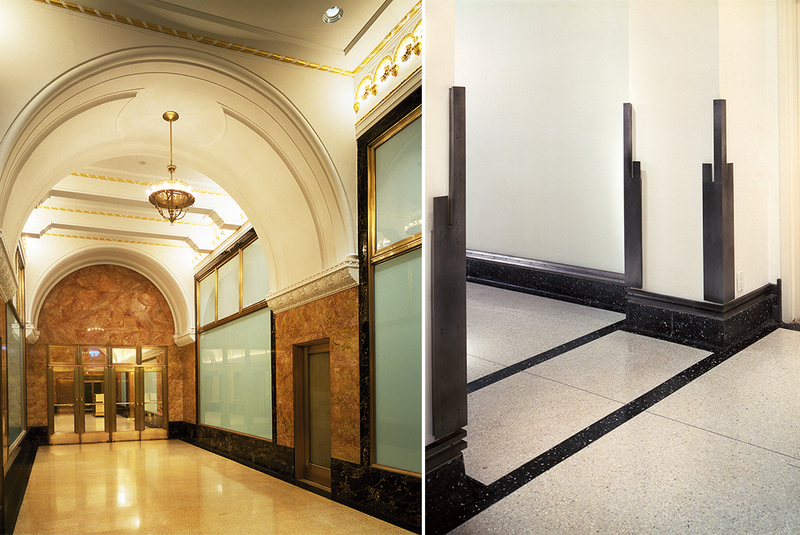 In the early 1990s, George Ranalli Architect completed a project to restore and update The Fashion Center Building. 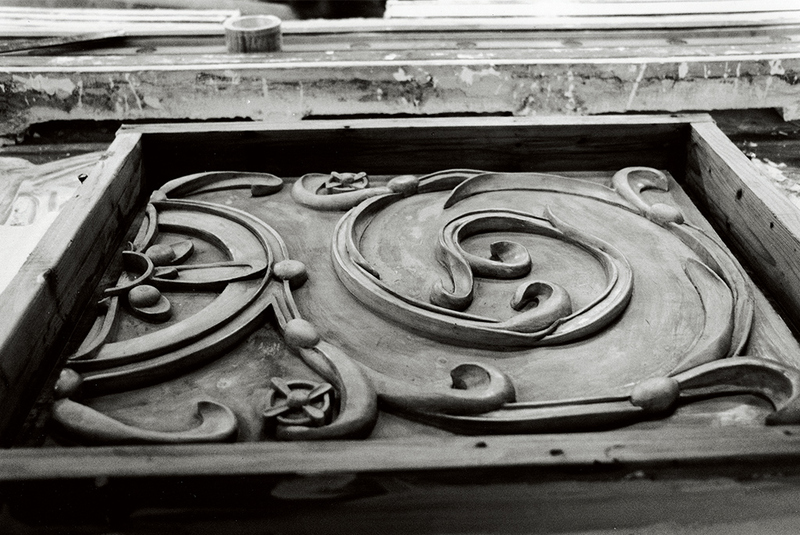 The process began when a small group holding title found themselves the reluctant stewards of a 23-story Romanesque-Revival structure in the heart of Manhattan’s Garment District at 525 Seventh Avenue. Sensing an opportunity, irrespective of the building’s shabby condition and sluggish rent rolls, the Owners’ were not ready to hang up the “For Sale” sign. George Ranalli Architect conducted an evaluated the building and researched its genealogy. 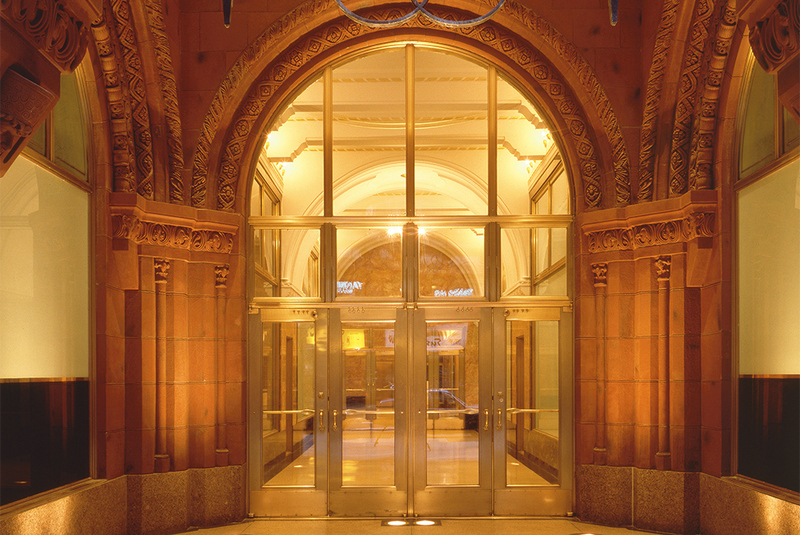 As it turned out, the building was a little known work of the prominent Chicago architect, Henry Ives Cobb, circa 1923; although two previous alterations had left it beyond recognition. 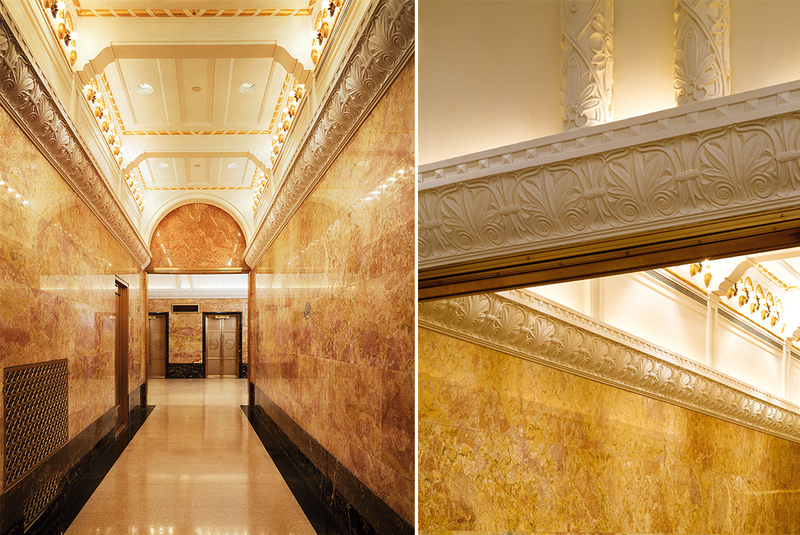 Restoration work recreated the building’s destroyed exterior facade elements, reopening the building’s portico entry, previously closed off behind mental doors, and the magnificent adjoining lobby spaces, each encased underneath eight-foot high drop ceilings. Noninvasive techniques also updated the ‘al fresco’ entrance, adding new flooring and exterior lighting, illuminating Henry Ives Cobb’s terra cotta and wrought iron composition. Inside, modern lighting design was tucked inside delicate, newly rehabilitated ceiling fixtures, set into a reconstructed vaulted, cast-plaster ceiling. 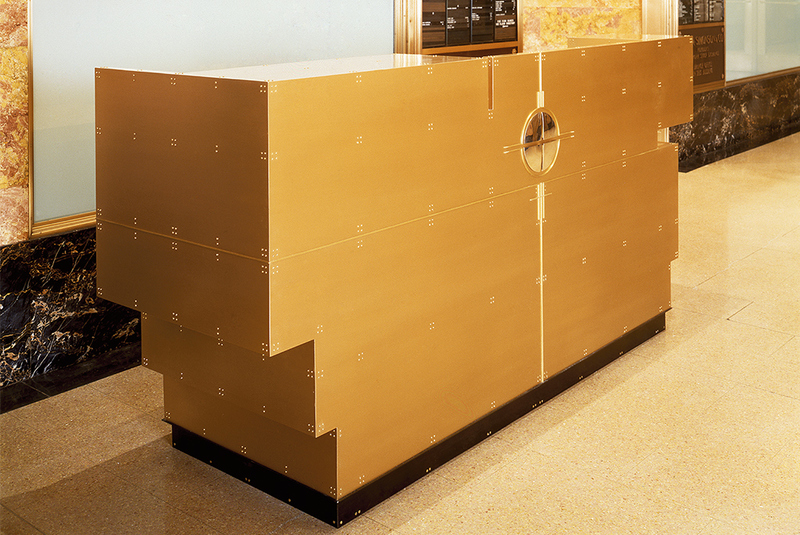 Marble wall panels, bronze window frames, heating grills, and elevator doors were also rehabilitated, and new bronze reception desk became a companionable contemporary element. On the building’s upper floors, updating the common areas included new lighting design, terrazzo flooring, custom-cabinetry, and milled aluminum trim, rising and wrapping around corners. The project successfully restored the building’s original distinctive appeal while also attracting a new tenancy. 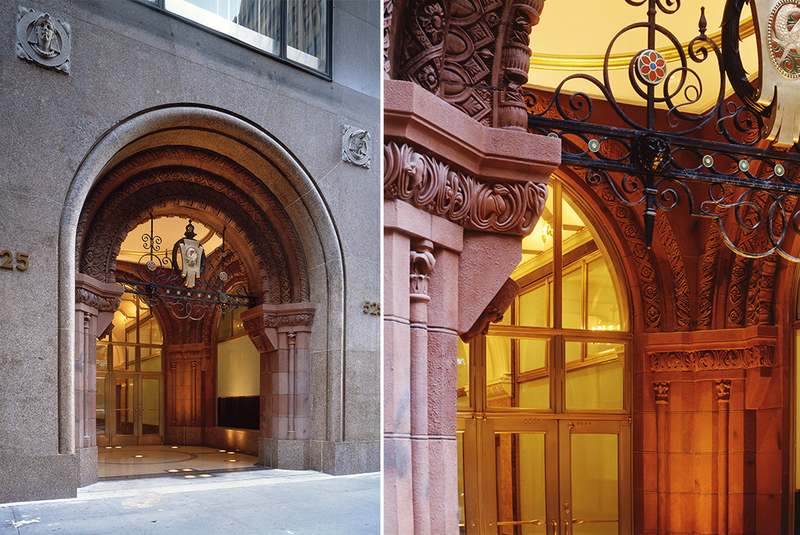 The Fashion Center Building historic restoration and renovation project successfully brought back the aura of Henry Ives Cobb’s architecture of ethereal beauty, which accommodated contemporary building system upgrades, helping to assure a long and prosperous future for the building and its owners. The New York Times. HOME & GARDEN. “Hard Work, Being a Man Of Steel” By WILLIAM L. HAMILTON. FEB. 17, 2000.